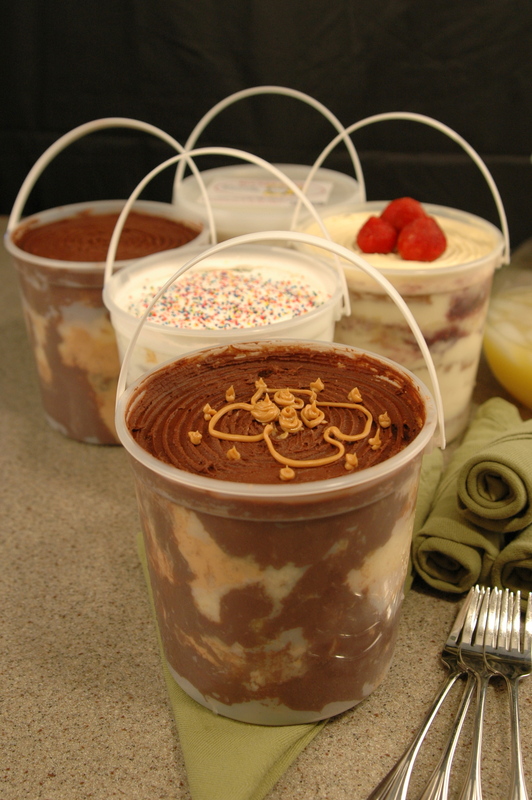 BUCKETCAKE is patent-pending, ready-to-eat frozen cake with filling and frosting in a recyclable 64oz plastic container with an easy-carry handle and a snap-on lid. Bucketcake is not just a party cake, it's a convenient, grab and go product. It is "Cake to Go" for spontaneous busy people. Simple to transport, serve and store. Carry Bucketcake with one hand and toss it in your car and head home or off to the park or beach or office. Bucketcake contains a completed two-layer cake. gently compressed and frozen. Bucketcakes average weight is 3 pounds and contains 20 - 3.2oz servings. Remove the lid and serve with a large spoon. Replace the lid to keep leftovers fresh for 6 months in your kitchen freezer. Experience the refreshingly cool and unique taste of all its elements right from the freezer. Each bite of Bucketcake contains a taste of cake, filling and frosting. This cake is a unique dessert never been manufactured before.